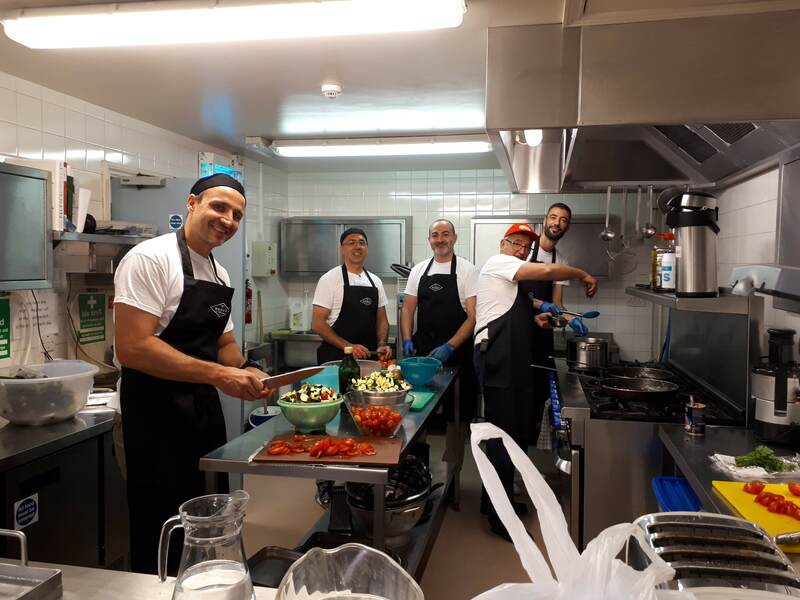 The Mediterranean came to the Marylebone Project on Thursday 21 June as colleagues from the gaming firm and Marble Arch BID members IGT, based in Marble Arch House, rustled up a mouth-watering Italian feast for the residents. The Marylebone Project is the largest single women’s shelter in the country. The charity has 112 beds for homeless women and runs essential services through a drop-in day centre service. The charity supports women to return to independent living through providing education, employment support and training opportunities. Drawing on the Italian blood of the team, the menu included two summer pasta dishes, a caprese salad and homemade tiramisu and cakes. 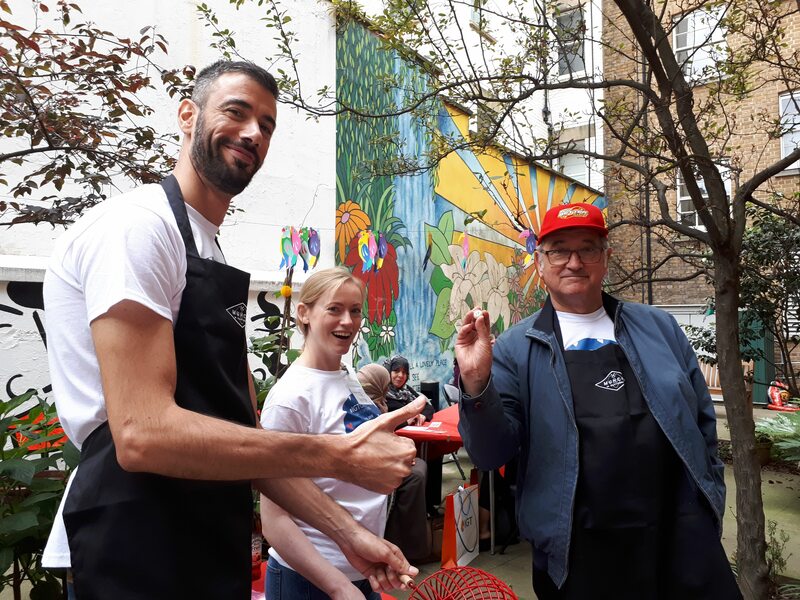 The meal was enjoyed by over 30 residents in the courtyard garden at The Marylebone Project. 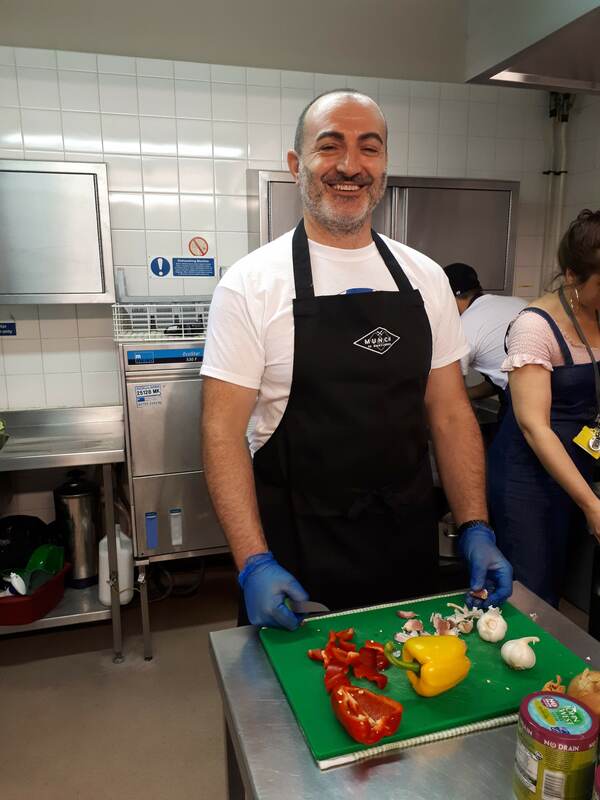 The appointed volunteer Head Chef addressed all the women at the start of the afternoon – introducing the menu and thanking the Marylebone Project for hosting them. Everyone then tucked into the meal, chatting and laughing as if they had known each other for years. Sat in the sunshine with bunting hanging between the trees and along the windows, there was a holiday atmosphere in the air. “The IGT volunteers were wonderful – interacting comfortably and easily with our clients. It was clear how much our women appreciated the healthy food the team prepared, the decorations and the chance to enjoy conversations with the volunteers. We are all very grateful for the time IGT spent with us and hope to see them return again soon” (Leyla Ojeda, Marylebone Project). During the morning, three of the volunteers left their colleagues in the kitchen and used their Excel expertise to support in an IT class; sitting alongside the women and working with them one-to-one to teach useful tips and tricks. A high proportion of the women supported by the Marylebone Project speak English as an additional language and so this focused support was hugely valuable – enabling the women to ask questions, practise new skills and work at their own pace. The afternoon ended with a very entertaining and competitive game of bingo. IGT generously provided an assortment of prizes, as well as a goodie bag for all the women who attended the lunch. “You initially think you are doing something for other people who are less fortunate than yourself, but you end up realising that it is the volunteers who are the real beneficiaries. We got so much from the experience, both as individuals and team members. It was an extremely enjoyable and entertaining afternoon and one we hope to repeat” (Pier Francesco Boccia, IGT). If you would like to spend time supporting a Marble Arch charity, or who like to find out more about our Community Programme, please contact Emily.